End of Grade Reading vocabulary words to help students on end of year assessments. This file contains all five lists being sold separately at Ruhl's Room. 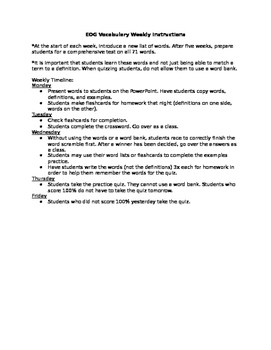 Each set includes a teaching timeline, a PowerPoint introducing the words and definitions, a crossword, a word scramble, an examples practice worksheet, a practice quiz, and a quiz. All answer keys are included. By purchasing all five lists at once under this listed file, you receive six additional review PowerPoint presentations, two additional crosswords, and a comprehensive test (test key included).